Digitization and the reliability of accurate measurement data are inherent to the constantly expanding demands of the energy distribution and production industries. And consumers are also demanding more accurate and traceable data to protect them from damage and costs as well as to continuously optimize their energy consumption. But what if systems or transformer stations are not yet linked to the digital world and time-critical data still has to be available?Photo: Time synchronization via satellite. Highly accurate measurement devices in the SINEAX, CENTRAX and LINAX series are now equipped with NAVSTAR-GPS functionality. 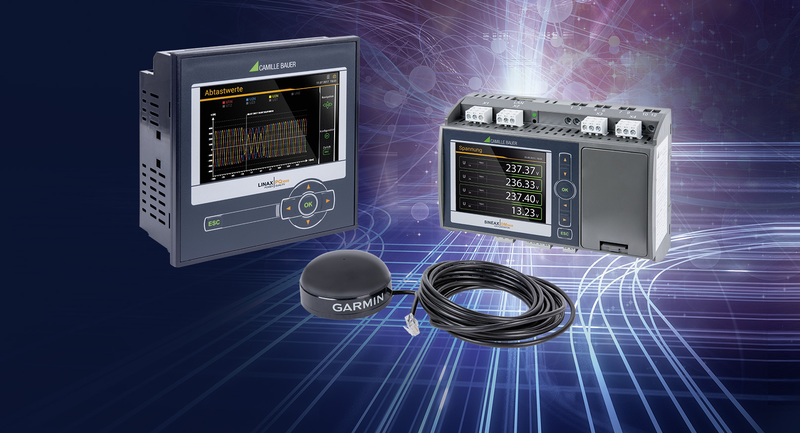 To provide this capability, Camille Bauer Metrawatt AG equips its highly-accurate measurement devices in the SINEAX AM, SINEAX DM5000, LINAX PQ and CENTRAX CU series with GPS modules. The pre-configured GPS modules synchronize the integrated time measurement of the devices using GPS signals, to ensure that each measurement value is recorded with the globally correct date and time. Timestamps are important when performing sensitive energy measurements. And also, when problems occur, they can be promptly detected before it becomes too late. If the fault has already occurred, accurate data with a precise timestamp are essential to be able efficiently pinpoint the causes. When there are specific network quality issues, either with respect to IEC 61000-4-30 Ed.3 norms or non-standard network criteria (for example absolute performance monitoring, individual threshold exceedances) accurate timestamps are a must. They make it possible to supply the event monitoring software reliably with time-critical data. As well as this, standardized, IEEE 1159.3-compliant, PQDIF files can be retrieved, saved and read with accurate timestamps directly from the device using PQ-DIFFRACTOR or the SMARTCOLLECT data management software. Accurate timestamps are also an essential component of automation applications; for example lighting controls, network load symmetrization and monitoring of production resources such as transformers, motors, etc. The official designation of GPS is "Navigational Satellite Timing and Ranging - Global Positioning System" (NAVSTAR GPS) and it is now pervasive in mobile devices like smartphones and navigation devices. Each satellite is equipped with one or more atomic clocks. The major advantage of GPS signals is that GPS receivers only receive data from satellites but do not transmit. Because the position detection is normally done by computing the signal propagation times between the satellites and the GPS receiver, no information can flow to unauthorized third parties.